Come play in the music sandbox! My flute student James told me about a new “music sandbox” website that provides mini lessons for the budding composer. James’ friend, Dennis DeSantis, was involved with the project. These mini music lessons are perfect for people wanting to learn more about composition, especially in apps like Garage Band. My 12 year old son, who likes to work with loops in Garage Band, will enjoy these simple lessons. Lovers of electronic music will find this especially helpful. The lessons are progressively more difficult so if you can skip ahead if it’s too simple. I promise you will find something in these lessons that will challenge the way you think about music composition, digital or acoustic. Everything on this website is presented in a simple, visual interface that allows for discovery. There are parameters, but we are free to experiment. Music has rhythm and pitches, but the magic is made in the infinite combinations. I enjoyed the section on writing bass lines. As a flutist, this is not something I have a lot of experience with! 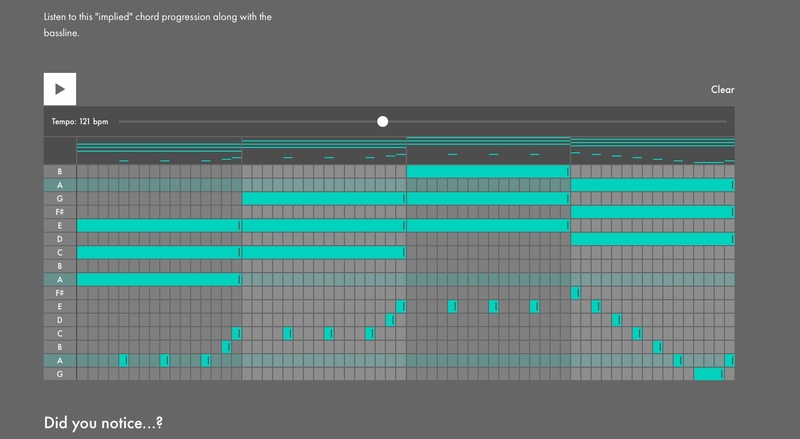 screenshot on section about composing basslines.